What are the 'Clear' podiums and how can you protect your data when using them? 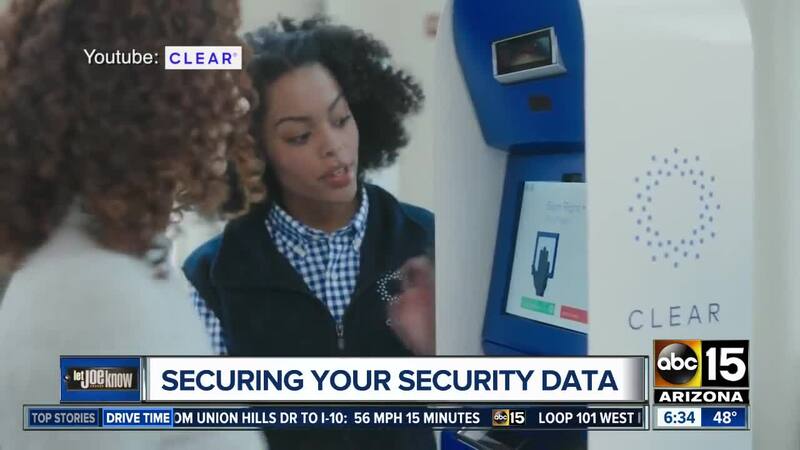 Airports around the country are partnering with a security company that uses biometric data to allow consumers to get through security faster. CLEAR technology is designed to give travelers a fast track to security screening by use their fingerprints or iris-scans as identification. Rather than waiting in line for a live Transportation Security Administration agent (TSA) to scrutinize boarding passes and identification, users walk up to a kiosk, get scanned and head to screening. Kiosks have been installed at Phoenix Sky Harbor since July 2018. They are available in 34 other US airports and stadiums with more than 1 million members, according to the company. But what happens to all the information they gather? Where did the company come from? And why should consumers trust them with such personal data? After a 2008 breach of former owner Verified Identity Pass Inc --involving a missing laptop with unencrypted member information--the business shut down. New owners took over in 2010, revamping security and the product. Since then, the company has become Safety Act Certified which means it has received the Federal government's stamp of approval for anti-terrorism technology. The Act, passed in 2002, was enacted to encourage private businesses to invest in anti-terrorism technology. Is sharing your biometric data worth skipping long TSA lines to you? Let Joe Know links to know!